In this episode of To the Point, I wanted to spend a little bit of time on a couple of items I’ve shown off before in Currently Inked episodes, but that don’t really require full reviews of their own. 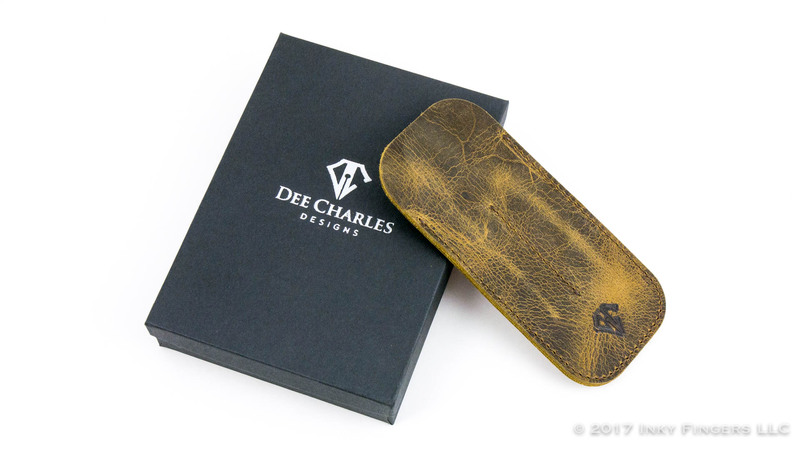 Dee Charles Designs is a company I’m not super familiar with; they appeared on my radar mainly due to Pen Habit sponsor Pen Chalet. These pen sleeves come in 1- or 2-pen models, in three different colors of leather, with each leather color having the option of three different colors of thread. (Black/Gold, Black/Black, Black/Red, Rawhide/Blue, Rawhide/Brown, Rawhide/Gold, Sunrise/Black, Sunrise/Blue, Sunrise/Red). My only real concern with this pen sleeve is that it’s not terribly well-suited to fit larger pens. Even on moderate-width pens, the fit is very tight. And while I’m certain the leather will stretch out a bit over time, I would be a bit hesitant to put delicate or larger pens (like my Danitrio or my Visconti Divinas) in this case. I had to use a fair bit of force to shove the pen into the slot all the way. If you’re a fan of more slender pens or have metal pens that you can use to “condition” the case, that might help a bit to stretch out the leather and give you a bit more slack for larger pens. 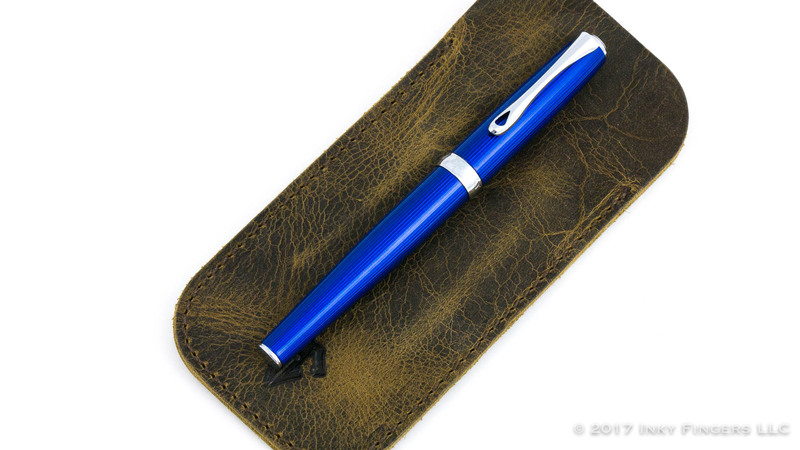 The sleeve’s slim line does provide a nice benefit if you’re looking for a low-profile, low-bulk way to protect your pens while you carry them with you. This would fit nicely in the inner pocket of a suit jacket or a front pocket of a backpack without taking up much room. There’s no real padding on the interior of the case, but the leather is thick and sturdy enough to provide a lot of good protection. 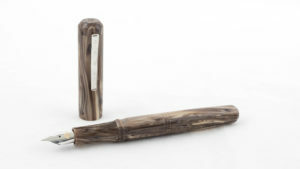 The Dee Charles Designs Pen Sleeves run approximately $20 for the single pen sleeve and $25 for the double pen sleeve. 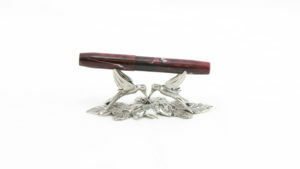 You can use the code PENHABIT10 to get 10% off your entire order at Pen Chalet. 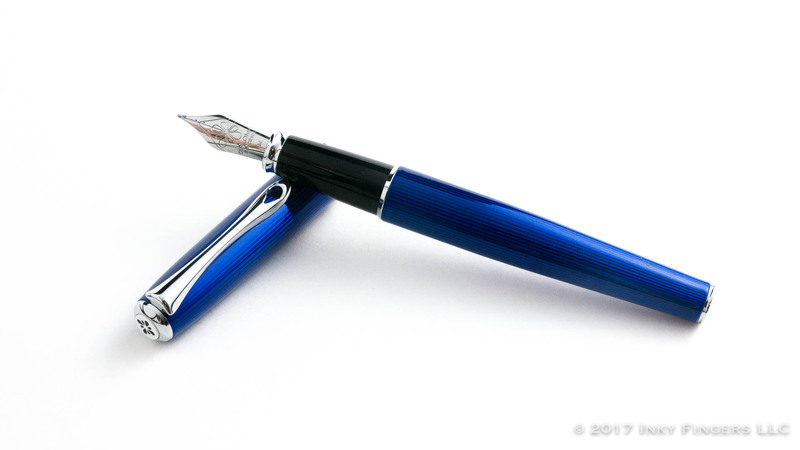 I’ve reviewed the Diplomat Excellence A before in its “Evergreen” iteration. You can see the full review here. I really liked that pen, and I loved the nib. Now, I don’t usually review a pen all over again just because it’s in a different color, but there’s a couple of minor differences in this pen that it makes sense to do a quick revisit to the model. The basic functionality and design are the same across the models. The biggest difference can be found under the electric blue translucent lacquer. Where the Evergreen model had an opaque, rich forest green lacquer, the body of the Skyline is guilloched with lovely, parallel(ish) lines that run the length of the cap and barrel, and is then overlaid with one of the most eye-catching blue lacquers I’ve ever seen. It’s rich and bright and feels very solid. 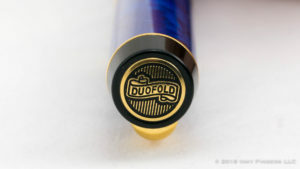 The guilloche underlayment makes the pen feel a little longer and more refined. 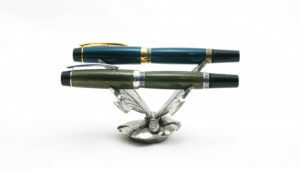 It gives the pen a bit more of an art deco look than the other models of Excellence A. The rest of the pen is pretty much the same. It’s solidly built, the clip is solid, the snap-on cap is solid and, like ever Diplomat pen I’ve ever used, has a glorious, smooth, and moderately wet Jowo nib. As I mention in the video review, Diplomat does use Jowo-made nibs, but they’re custom-made for the company (they don’t have a breather hole, for example), and the company takes pains to ensure that the nibs are finished better than almost any other steel nib on the market in my opinion. I’ve never had a Diplomat nib that was less than stellar, and the steel nib on this pen is no exception. The items for this review were provided by Points of Distinction and Pen Chalet (previously a sponsor) free of charge for review and giveaway. No additional compensation was provided, and there was no expectation of a positive review. All opinions expressed herein are my own.